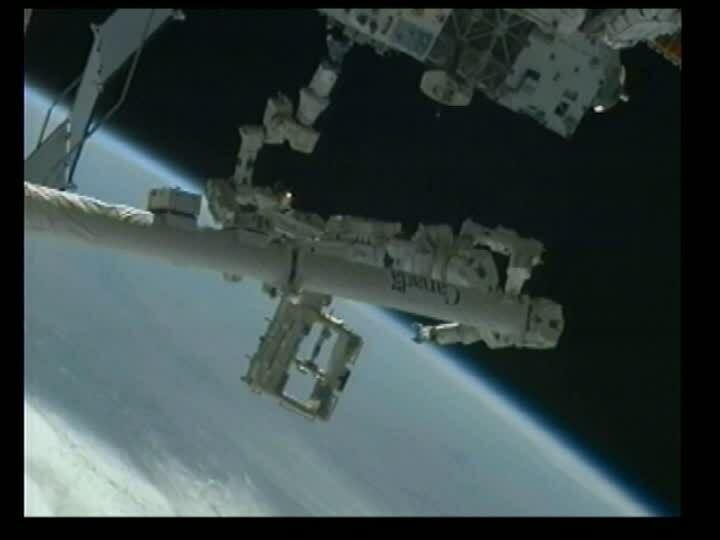 Dextre on the end of Canadarm2 on Day 2 of the RRM mission (Credits: NASA). RRM is an ISS based experiment designed to demonstrate the technologies, tools, and techniques needed to robotically service and refuel satellites in orbit whether or not they have been specifically designed to be serviced. The experiment utilizes the Special Purpose Dexterous Manipulator (Dextre) – a two-armed robot developed by the Canadian Space Agency – complemented by a set of interfaces called “representative satellite fueling interfaces,” a fluid transfer system and four robotic tools. Satellite servicing has the potential to provide the means to fix and refuel satellites, extending their operational life, allowing recovery of spacecraft launched in the wrong orbit as well as disposal of obsolete ones, thereby reducing the problem of orbital debris. This was the first of six RRM technology demonstrations scheduled for 2012. The next experiment, scheduled for May, will test remote manipulation of a valve assembly from the mock-up satellite, followed by a high-profile robot-controlled satellite refueling demonstration scheduled for July.